Is this the end? The end of Summer? Or without being so demanding, is this the end of Springtime days? Calm and mild with just a little breeze. What is happening? All these questions are for real, they are not just rhetorical. We really need answers! Looking at the sky every morning when we wake up is becoming a kind of torture and inevitably, the result is the same: sad, dull, grey, wet, cold. To sum it up: BORING! Of course, we are talking about our own experience as French guys, we hope that wherever you are all around the world you are living under more genial skies. What a mess! No ways of wearing shorts, sandals, our new cool tee-shirts (without a jacket at least!) or experiencing life through different shades thanks to our crazy collection of sunglasses. The only accessory we can afford is umbrellas. So much fun... Even in the South of France where usually the sun is always shining (and the birds are singing, all people are laughing.... ok ok...), the weather is awful. In Cannes, stilettos have turned into rubber boots! But we are not here to speak about weather or temperatures, even if the acronym of We Are Ready Made is W.A.R.M. We are here (not godsent but almost) to speak about Fashion and the only positive thing about this dreadful climatic (and far too long) episode is that the prophecy, made by some designers during the SS13 collections, is becoming true! Indeed, they have seen this disorders, they have predicted showers (not fashion showers just showers) and cold and what seemed at that time curious/weird proposals makes complete sense now! Fashion designers are the new prophets, no need for further proofs. Take the example of CARVEN, for his Summer collection, Guillaume Henry, the charming designer imagines the wardrobe of a girl who is lost in India or in some kind of safari, wardrobe including cute dresses, skirts, jackets and coats. And the materials used here are tweed, wool and viscose. Not really the materials you expect to find in a Spring Summer collection. This effect of warm in Summer is reinforced by the styling. Models are all buttonned up and protected by large belts and except for the lovely cutouts details on some dresses and coats (after all, you need to breathe and feel some air on your body), skin is hidden. Henry's vision is clearly a new vision of what Fashion should be now. His aim is to show that girls/women need to have a complete wardrobe with timeless (and weatherless) pieces where coats have a prominent place. 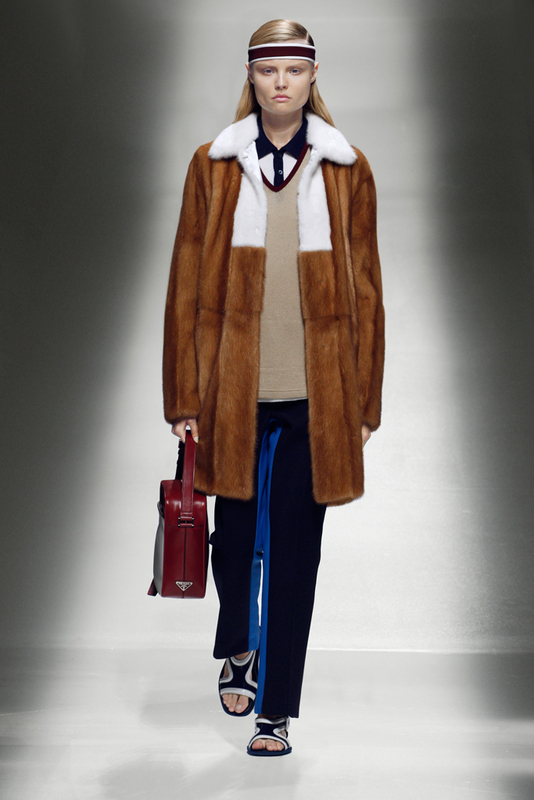 This idea of coats is also predominant in Miuccia Prada's collection for MIU MIU. We know that she is fond of coats and she'd rather make a beautiful coat than a beautiful dress (we love Miuccia's statements so much). In this collection, there are almost as many coats as silhouettes. It always has this oversized and round shape with three-quarter-length sleeves and hidden buttons. It all starts with a coat worn by Raquel Zimmermann and ends with Karen Elson wearing one too. The silhouettes are similar but come in different colours and materials. This idea of repetition reminds us of Monet's different versions of the Rouen Cathedral. Always the same but not quite the same. Here and contrary to Carven, the Miu Miu lady (we just see her as a lady and not a girl, she is so stylish!) is wearing lighter and more spring materials such as denim (transcended to be more than a mere and plain fabric), satin and silk. There is no compromise in Miuccia Prada's work and this idea is reinforced by the use of another fabric quite unusual for the Spring Summer season: Fur! For the Winter collections, there was no fur in her different works but with Spring coming, it seems to be her Number 1 obsession! First, in her PRADA Resort 2013 collection where she proposes some furry silhouettes quite far from the spirit of such a presentation, traditionally used to show the perfect outfits for a cruise or faraway holidays in some warm countries. She even pushes the envelope further by making tank tops (the perfect Summer outfit) in fur. The looks are sporty, very WesAndersonian but with a wealthier and smarter touch. 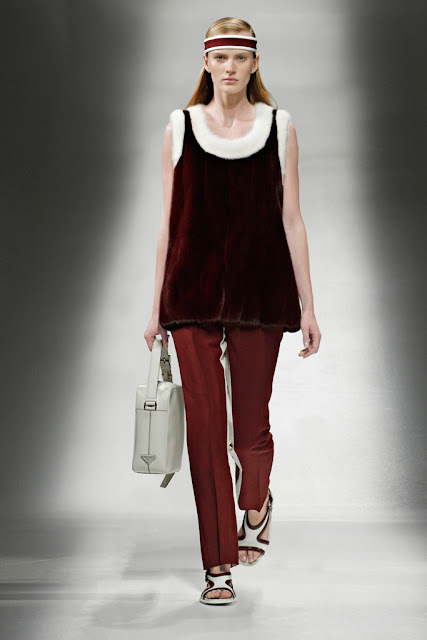 Then, with the Prada SS13 where fur comes in different colours and forms (coats, tops or boleros), Miuccia seems to play with us and tells us that she doesn't care by styling the models with fur coats and almost nothing but underwears. It conveys this idea of hyper-femininity (after all, this collection is inspired by Geishas who are luxury prostitutes) and not a classical (and boring) conception of beauty. To loop the loop, Miuccia has also designed fur printed coats and tops for her Miu Miu lady reinforcing this concept of power and timeless class even if this collection is clearly inspired by the 40s. 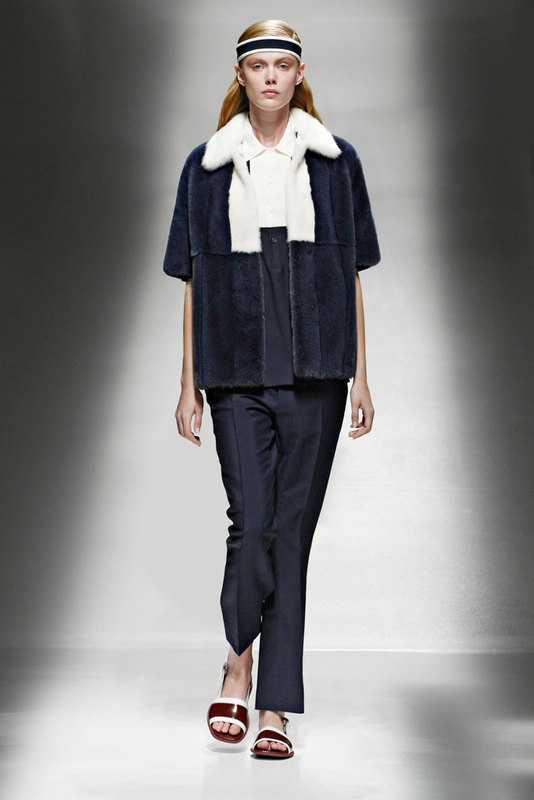 And she has created the must have accessory of the season and the weirdest for a Spring Summer season the furry stole! Perfect if there are some drafts in your warm holiday resort. Once again, Miuccia styles it with a luxury bra/vest and says that whatever the season, fashion is a game so let's play with it! The concept of wearing coats or warmer fabrics (fur, wool, tweed or viscose) during Summer is a brand new conception of fashion. By making such a statement, designers are telling us that Fashion should not be taken seriously even if you have to take into account what your customers may think. They transcend this idea of a wardrobe for each season because it is no longer how people want to reflect. Just like there are no particular colours for each season or gender, there are no longer particular materials or clothes for a particular moment of the year. We really have to look further and beyond these mere clichés and prejudices. The world is changing, is evolving so why not changing and evolving with it?